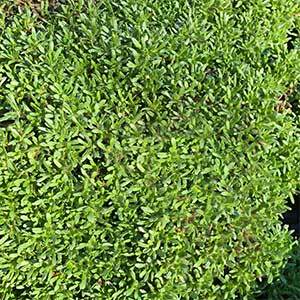 This hardy low growing thyme is from Cyprus, and Thymus integer with its dense foliage is a species that has a number of garden uses. It can be planted between pavers, it looks great in a sunny rock garden an is a great plant for a fragrant lawn substitute. You will also find it suited for growing in containers where it can be used to underplant taller plants that require similar growing conditions. The plant is also used in traditional medicine in Cyprus, it is rarely offered for sale, however is one of the many Thyme species worth seeking out. This is a species that naturally grows in rocky exposed areas. It requires excellent drainage as well as full sun to thrive. Once planted and watered in it requires very little care. A little liquid seaweed fertiliser each spring will, be about all it requires in terms of fertiliser. The easiest method of propagation is by division of established clumps. Soil – Humus rich loamy soil that receives some moisture in summer. Spread – Will Spread to .4 metres and more in good conditions. Flowers – Pink rising on stems above the foliage. Frost tolerant – Will tolerate light frosts only, best in frost free zones.